NICG is an international strategic consultancy, with bases in London and Beijing. Offering its services to international corporations and governments, the firm leads the market in supporting clients to operate successfully in China and other international markets. All NICG’s solutions are bespoke for the individual client’s needs. 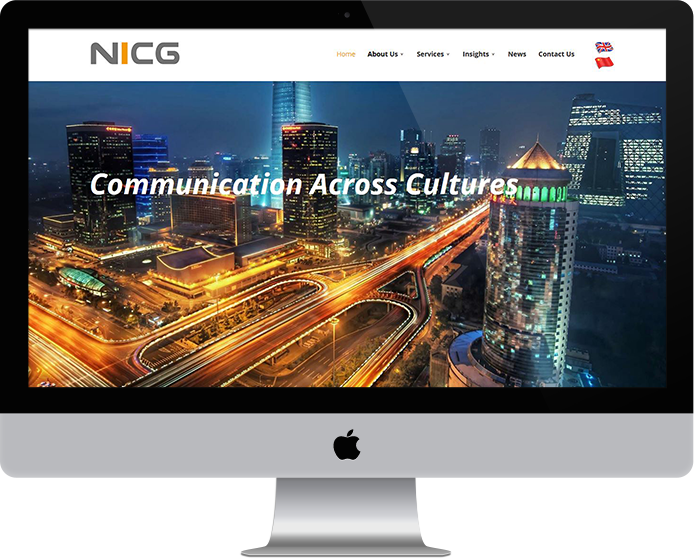 Our brief was to create a new website that promoted the service of NICG Newland, with the added challenge of needing to deliver content for two markets – Chinese and International English. We worked closely with the client to understand the requirements of both target markets, and developed a website that was able to switch seamlessly between the English and Chinese versions of any content. With this in mind, it was vital to product a very clean and simple design that would work equally well with Chinese and English text, so that the traffic in both languages could be effectively captured. Thanks to NICG providing us with the content and text, we were able to focus on delivering a clean and uncluttered design, which also helped to reinforce NICG’s existing corporate branding, which has a similar strong and simple design. This ensured the visual look of the new website reinforced NICG’s reputation as a professional and trustworthy brand. The resulting website delivers a user-friendly and straightforward experience, which directly reflects NICG’s brand and leading reputation. The clean and simple design also enables the website to capture traffic from both English and Chinese-speaking markets. A content management system that NICG staff can use to update the website themselves, without the need for technical skills.